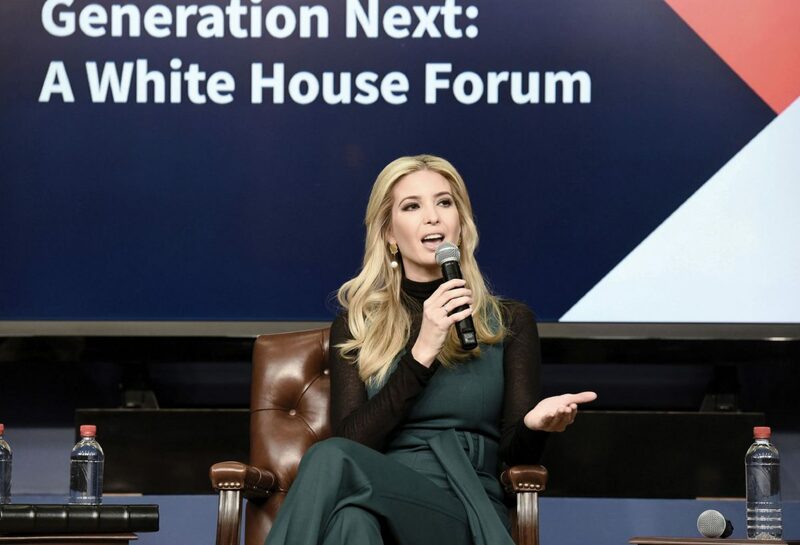 Olivier Douliery | Abaca Press via TNS Ivanka Trump, advisor to President Donald Trump, speaks at a forum on March 22 in the South Court Auditorium in Washington. Trump is shutting down her self-named fashion company. Thanks to the Trump administration’s pro-growth policies, the U.S. economy is booming. Unprecedented deregulation and the Tax Cuts and Jobs Act, which brought historic tax relief to American businesses and families, are major factors in this success. The growth in GDP last year surpassed expectations, the unemployment rate sits at just 4 percent, and over 3.2 million new jobs have been added since January 2017. Minority groups, workers without high school degrees, and those with disabilities are experiencing greater job opportunities. America’s economic future is bright. However, our strong economy has brought a longer-run issue to the forefront: Employers are having trouble finding enough workers with the right skills. That’s unfortunate because despite recent progress, millions of Americans who could work remain out of the labor force. If we could more effectively build workers’ skills and bring more nonworking Americans off the sidelines, our economic future could be even brighter. Why aren’t workers always able to find jobs that match their skill sets, even in this hot economy? Americans are now less likely to move if they lose their jobs, even if the demand for their existing skills is greater elsewhere. In addition, the pace of automation is reducing overall demand for certain types of skills, especially for people with lower education levels. However, our current policies are also part of the problem. In a recent report from the President’s Council of Economic Advisers, we estimate that public investments in formal education drop to low levels by the time Americans turn age 25 and then fall almost to zero by age 40. While employers do invest substantially in the training of college-educated workers through these prime-age years, employers invest only about half that amount in workers with only a high school degree. It may have made sense in years past to front-load our public investment in skill formation almost exclusively at young ages during a time when it was still possible for a high school graduate to adapt to the changing demands of employers. But in our rapidly evolving economy, a stagnant skill set, especially for those with no more than a high school education, is no longer a realistic recipe for long-term success in the job market. We need to ensure that all workers — including those with lower education levels — are able to update their skills throughout adulthood. Fortunately, there are important actions we can take to invest in Americans’ skills and improve our economic future, without blindly expanding ineffective federal job-training programs. One reason for the skills gap is that workers simply don’t always know which skills are most in demand, including in their own communities. Private-sector markets are already reducing the cost of successful skills matches between employers and potential workers via online job posting aggregators. By collecting and categorizing available job postings such as education requirements and location details, these online tools enable employers to more efficiently recruit workers whose skills and experience meet their needs. But greater support for these efforts is necessary to generate accessible and timely job information for all sectors of the economy and in all regions of the country. We also need to invest scarce public dollars in smarter ways. For example, federal Pell Grants subsidize higher education for low-income students, but minimum program lengths make it difficult to use funds to retrain quickly for a sector that requires a new skill set. Expanding Pell Grants to high-quality, short-term programs could allow more workers to rejoin the workforce rapidly with new skills necessary to flourish in sectors with the greatest demand for workers. Apprenticeships, another promising model, help workers build on-the-job skills with employers. Despite proven success in boosting workers’ labor market outcomes, apprenticeships make up less than half a percent of the workforce in the United States, compared to about 2 to 4 percent in Australia, Great Britain, Canada and Germany. The Trump administration is focusing on expanding apprenticeship models, and state-led efforts have shown promising results. As we continue to refine our approaches to address America’s “re-skilling” challenge, one fact stands out: The market demand for workers who can learn new skills is only going to grow. Employers are facing a shortage of workers with the right skills. As automation in general and specifically artificial intelligence continue to change the economy, re-skilling will become increasingly important. Our economic future — and the future of American workers and their families — depends on how well workers can adapt to our changing economy. Millions of Americans are back in the workforce because of the Trump administration’s pro-growth policies. Smarter investment in our workers will ensure that a more flexible workforce is ready to continue this growth into the future. Ivanka Trump is a senior adviser to President Donald Trump. She wrote this column for the Dallas Morning News.